The ALX-SSB is based on a modified board, originally sold as the CS series by QRVtranics. See http://www.qrvtronics.com/CatHAM_Radio/ ... ries.htm. The CS series from CRkits has a digital VFO, but no display - past a simple tri-color LED. In other words, very hard to track your actually frequency. The ALX-SSB is the CS main board, a new digital VFO and display as shown above. Any of these versions of the radio may be purchased as a kit or as a fully assembled and tested radio. It can be had as a single or multiband unit. Note – there are no SMD parts – this rig is fully thru-hole. Anyone that would have tried a Heathkit of old can easily build this radio set. There is less point-to-point wring on this rig than in my old HW-7, for example. Full disclosure, I have no interest in QRVtranics, but I have provided some suggestions to the vendor for the documentation of the radio set. As an aside, I wrote a 60 page operations and technical manual for the MFJ-9296 (-9200) travel radio a couple years back. The radio has since neem discontinued. Still, it was a lot of fun to dig into that rig. . I'm glad you asked. This is a small, single conversion, HF radio that has full band coverage out of the box for any one band and up to five bands within the North American Amateur Radio Service. Power out is 10 watts (slightly lower in the higher bands). The rig can be had as a kit or fully built by the vendor. It has full, English language, technical documentation. Yup – Native English, not transliterated Chinese (Chinglish) crud normally seen on the low end market. One of the big concerns most hams have with the low cost, QRP rigs seen on the market today is the proprietary MCU (control chip). Lose this and you own a brick. Add in densely packed SMD parts, parts that are unmarked for the most part, no technical documentation or schematics and you have a radio that - if it faults, realistically, goes into the trash. The radio is available as a kit, with full build documentation. Repair, maintenance and hacking (more on this later) are a breeze as all the data needed are available. The parts are quality, not take-offs and are well marked. Cost for the kit as a single band, with the speaker/mike is $150 US dollars, plus shipping. All manuals are on line at the QRVtronics site as PDF documents with illustrations. . The rig is available as 80/75 Meters, 40, 20, 17 or 15 meters. Full band coverage on each band and up to 10 watts output. Ask for a quote for the multiband unit, as several options are available. The radio is a common NE602/LM386 kind of setup. The final PA transistor is a IRF-510, which is noted for being more tolerant of high SWR at the antenna. The radio has a reverse polarity protection diode as well. 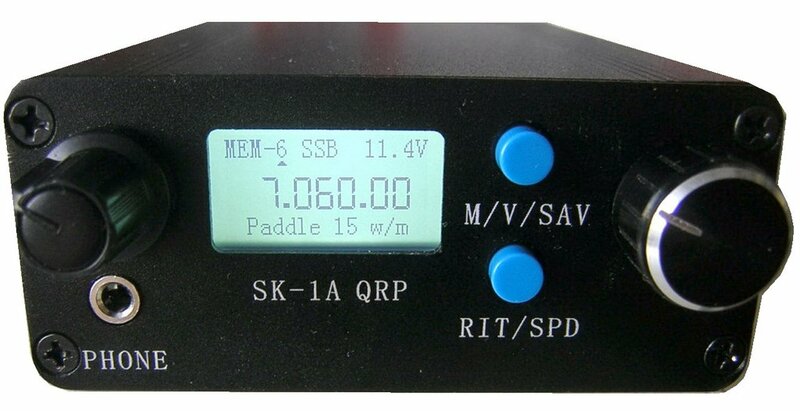 If you want to use this in the field, my suggestion is to add the QRPQuys antenna tuner (https://qrpguys.com/end-fed-half-wave-s ... enna-tuner). I have and use this paired to the rig. The tuner is sold as an easy kit, taking less than an hour to assemble. Weight assembled: 12 oz., not including microphone. The dual/multi band version is slightly heavier. All come with case and end panels. NOTE - power output is input voltage dependent. On my 8xAA NiMH battery pack, power was 8 watts on 40M and just under 4 watts on 20M. On a fully charged AGM battery, full power was no problem. My new 10 x AA battery packs work the treat with this rig. The controls are basic. On/Off. Volume. VFO tuning. No Receiver Incremental Tuning (RIT) or Clarifier. The VFO does provide for very fine tuning. Just no offset. USB'LSB selection is baked into the software and cannot be shifted on the fly. The display either may be an OLED or LED. I chose OLED for the lower power use. The speaker/mike is a modified commercial unit with matching 8-pin connector. You can roll your own, but I doubt you could do this for the $10 price – your call. Transmitter is clean and puts out enough power to be heard with a NVIS antenna setup for nearby (up t0 300 Miles) communications. This is solid state, broad-band, no tuning required. If you are using a non-resonant antenna, an external tuner is required. With 10 watts output, you will need the distant station to do some of the heavy lifting. Just the same, the rig has more than enough power to work DX, if that is your thing. For disaster comms, 10 watts is a good compromise between power out and power consumption. I have to give Larry, the owner of QRVtronics, a lot of credit. He took a basic kit and modified it for multiband use, with both filers and software to make that possible. Which is my Segway onto the 'hacking' part of this review. For that, I had to modify the software. Fortunately, that was fairly simple. The Arduino software is a free download and the code for this rig is heavily commented. If this seems like gibberish to you, there are a ton of sites that will walk you thru the code. Or, you can just save the code in case of a VFO problem. For the remaining commercial gear on the market, and almost all the low-end stuff from China, this is not an option. This software for the rig is available for download, if you wish to look at the entire package. See http://www.qrvtronics.com/Side_Left_B/Download.htm. This is a good quality, but relatively inexpensive SSB HF rig with 10 watts out. It's simple interface is so basic, a child can operate it. In a disaster situation, simple is better. No menus, no memories, no hassle. You can listen to AM SWB, with some care in tuning. The rig offers the opportunity to modify the Arduino code that runs the VFO for listening out of band. Construction is made with (all) through hole parts, so local repair is at least possible. Full documentation makes identification of parts simple. And these parts are obtainable from any numbers of vendors on line. The kit assembly instructions offer trouble-shooting tips as well. Use the supplied links to check any details where you would like to know more. I think my Xmas wishlist just got expanded. A tech can only use CW on some of the higher bands. Any recommendations on a keyer & tone maker? You're going to have to get that general then. This rig seems to be phone only. I'll have to power through that general! The cost of most HF rigs was keeping the General on the back burner. This makes it doable. Might as well raise the bar and go for extra too. You can test for it at the same session if you pass general. No extra charge. How would people here set this radio up for emcomms? To be cost and weight efficient, I"m thinking mono-band, half-wave dipole, coax and battery. If monobanding, I don't think a tuner would be needed if a resonant antenna was used. I"m thinking 40m is on the high end of the NVIS capable frequencies. My understanding is 20m is less affected by thunderstorms and generally gets more distance. And has a smaller footprint for apartments and does not demand quite the height above ground for maximum performance with a half-wave dipole. I"m thinking 40m is going to be better if wanting to contact friends in the 50-500 mile range. I"m curious what you all think and how you might set this up. And maybe you feel a multi-band radio is simply better. I"m thinking I"d use a HT w/ the option of a ladderline antenna for local comms and use the ALSX-SSB for that longer range communications with people who have the capability or can plan to have the capability. PS: I'm also thinking about the smallest weight and smallest volume for man-packing. Those are my goals for a rig like this. I'm thinking I'd go multiband simply to have the capability (since it adds very little weight or bulk) but primarily I'd be using 40m since that's what our state EM EOC uses for statewide comms and comms with DC. Your choice is going to depend on what band will allow you to communicate with the stations you need to communicate with, and it seems that you have that well thought out. I have 20M/49M because I'm in Alaska. I've been using a 10 x AA pack with NiMH cells, but anything that give ~12 to 13.8 VDC will work. You could use this as a CW rig, but you would have to twaddle the software at the code level - not something for the faint of heart. You might do better to find a used HB-1B or MFJ-9200 (9296) or even on old Heathkit HW-8, they can be found for $150 - the HB-1B can be found for $100 or so. If you are going single band and NVIS setup for 5 - 250 miles coverage, the 80 Meter might be the better choice..... Get the OLED display as it is low power. Don't forget this is sold (full technical documentation + schematic and all the Arduino code is on line for download) as a kit or for for $75 more,, Larry will build it and align it for you. All thru hole parts, all common parts, so local repair is possible. And yes, you'll need a General to get full use out of this. this up. And maybe you feel a multi-band radio is simply better. $180, no mike, no power supply - about 8 watts at 14 VDC. By the You Kits folks. About the same sized case at the ALX-ssb and in one band only - 40M. Still, it is an alternative. Great input and ideas, both of you! Thank you.